Have a collection of neutral bowls and vases. This is one of our go to tips! Bowls and vases can be used to hold just about everything! From food, flowers, utensils...really all of the above. So besides just being visually pleasing to have out on your countertops, they also serve a purpose. By opting for neutrals, you can ensure they can always be grouped and used together. Grouping bowls or vases of varying heights and sizes can also create a focal point in a kitchen and become a beautiful centerpiece. One tip to keep in mind is that odd number groupings always look better visually! Remember 3 instead of 2. We recommend going white and clear if you are in the market for new items. Clear vases are the perfect item for fresh flowers (our personal favorites being Italian Ruscus or Hydrangeas) and always give a crisp, fresh look! Invest in quality cutting boards and trays. 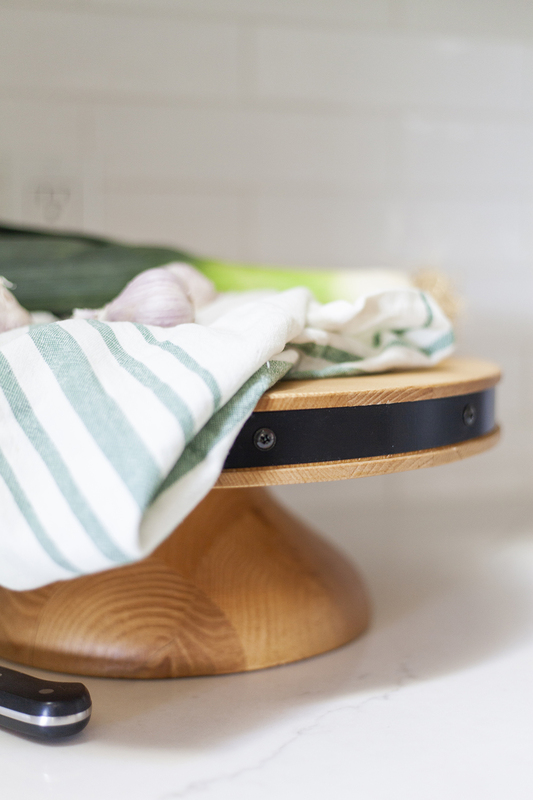 Cutting boards are another kitchen styling staple. They look great alone, but can also be layered and stacked for a completely different look. Rather than laying them flat on the counter, try standing them up against your backsplash to create more of a focal point. By having them out they are also easy to grab when you are hosting and easily used to serve foods! 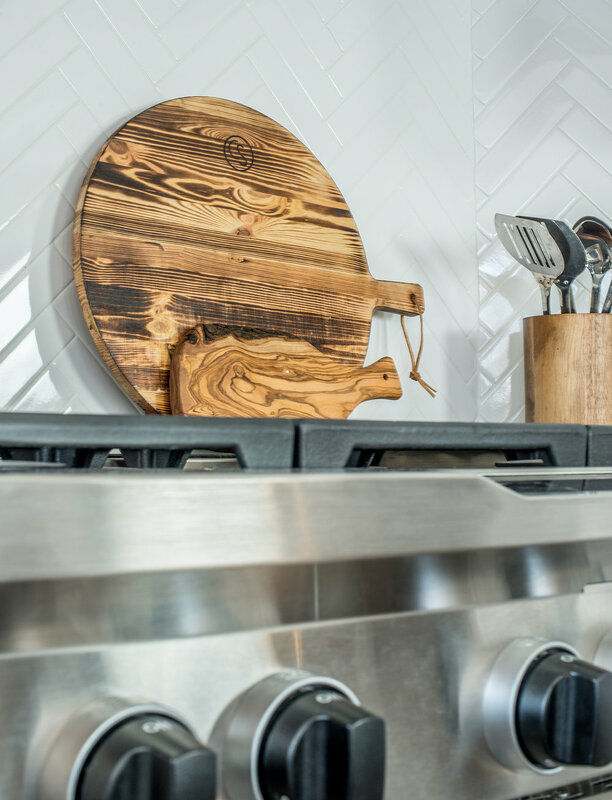 With so many types and shapes to choose from you can find one that compliments your kitchen and style perfectly. Square, round, wood and marble are just a few of the many varieties. It can be easy to forget about the beauty that comes with everyday food items, but it’s there! We use fresh foods almost every time we style a home for a photoshoot. Whether it is baked goods, fruits or vegetables, food brings both life and color to a space, especially a kitchen! So rather than tucking your fresh food away in the pantry, use the vases and boards we referenced to showcase it. Two of our choice food items that always look great out and bring a slight pop of color is pears or green apples. 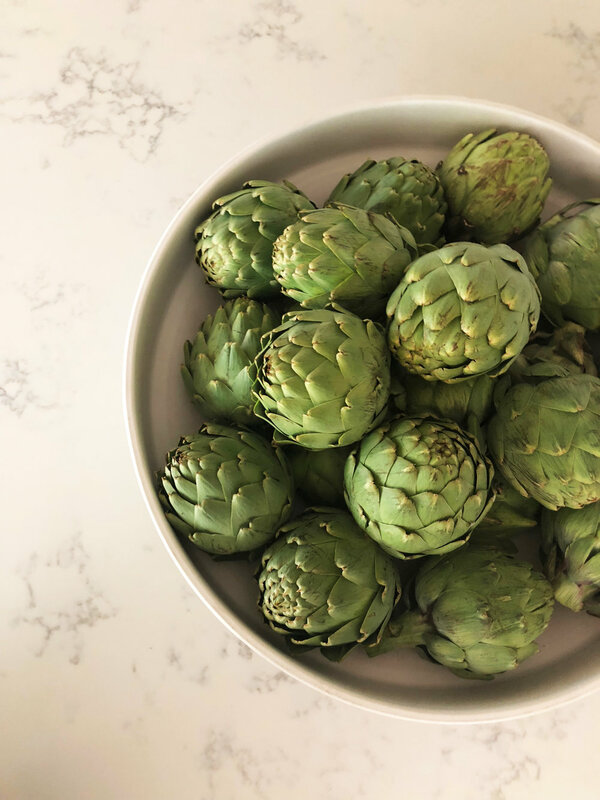 Artichokes, while more uncommon, are perfect if you’re looking for some fun texture! To shop more items perfect for styling your kitchen click here.